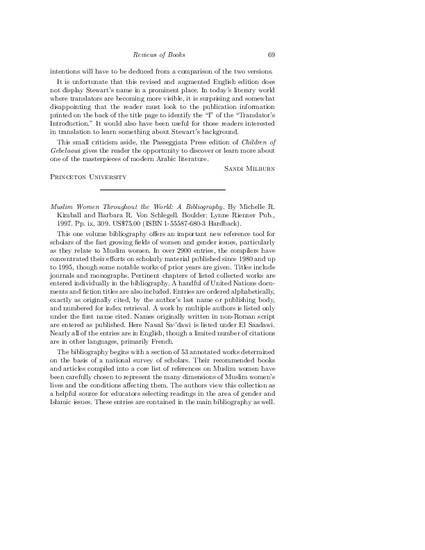 Book review of Muslim Women Throughout the World: A Bibliography by Michelle R. Kimball and Barbara Von Schlegell. Book review of Kimball, Michelle R. and Barbara Von Schlegell. Muslim Women Throughout the World: A Bibliography. Kern, Kristen. Book review of Kimball, Michelle R. and Barbara Von Schlegell. Muslim Women Throughout the World: A Bibliography. Boulder: Lynne Rienner Pub., 1997. Published in MELA Notes, vol. 65, (Winter 1998): 69-70.